Symptoms of Parkinson's disease include tremor, loss of smell and neuropsychiatric problems. However, many people aren't diagnosed until their disease is well-advanced, which could limit their treatment options. 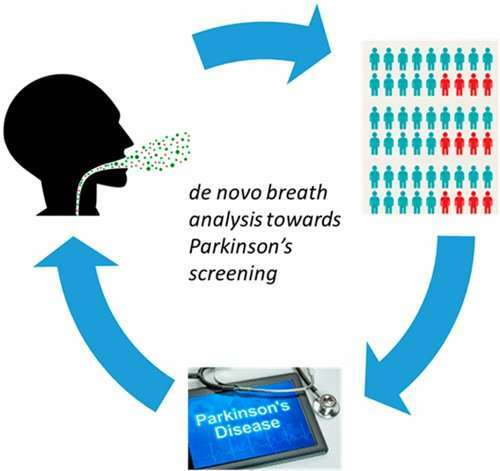 Now, researchers have tested a sensor to detect early-stage Parkinson's disease from the breath of patients. They report their results in ACS Chemical Neuroscience. According to the Parkinson's Foundation, about 60,000 Americans are diagnosed with the movement disorder each year. But by the time most people experience symptoms, they have already lost many of the dopamine-producing neurons affected by the disease. Diagnosing Parkinson's at an earlier stage, for example, at a routine doctor's visit, could help these patients begin neuroprotective therapy sooner. To this end, John P.M. Finberg, Hossam Haick and their colleagues previously developed a device with an array of 40 sensors based on gold nanoparticles or single-walled carbon nanotubes. Each sensor had a different chemical attached that could bind certain volatile molecules in the breath, and this binding changed the electrical resistance of the sensor. The device detected differences in the exhaled breath of people already being treated for Parkinson's disease and healthy controls. Now, they wanted to see if the device could detect differences in the breath of patients with early-stage, not-yet-treated Parkinson's disease. The researchers tested the device on the exhaled breath of 29 newly diagnosed patients who had not yet begun taking medication for their illness. When comparing the sensor output to that of 19 control subjects of similar age, they found that the array detected early Parkinson's disease with 79 percent sensitivity, 84 percent specificity and 81 percent accuracy, which was better than a diagnostic smell test and almost as good as an ultrasound scan of the brain. Although the device needs to be improved and validated by larger studies, the researchers say that it has potential as a small, portable system to screen at-risk individuals without the need for highly trained specialists. Early diagnosis of Parkinson's disease (PD) is important because it affects the choice of therapy and is subject to a relatively high degree of error. In addition, early detection of PD can potentially enable the start of neuroprotective therapy before extensive loss of dopaminergic neurons of the substantia nigra occurs. However, until now, studies for early detection of PD using volatile biomarkers sampled only treated and medicated patients. Therefore, there is a great need to evaluate untreated patients for establishing a real world screening and diagnostic technology. Here we describe for the first time a clinical trial to distinguish between de novo PD and control subjects using an electronic system for detection of volatile molecules in exhaled breath (sensor array). We further determine for the first time the association to other common tests for PD diagnostics as smell, ultrasound, and nonmotor symptoms. The test group consisted of 29 PD patients after initial diagnosis by an experienced neurologist, compared with 19 control subjects of similar age. The sensitivity, specificity, and accuracy values of the sensor array to detect PD from controls were 79%, 84%, and 81% respectively, in comparison with midbrain ultrasonography (93%, 90%, 92%) and smell detection (62%, 89%, 73%). The results confirm previous data showing the potential of sensor arrays to detect PD.